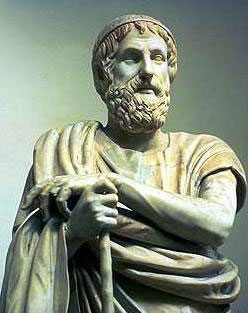 Homer lived in one of the Greek cities on the Ionian coast of Turkey- probably Smyrna (present day Izmir). He collected and then wrote down stories of the Trojan War. The war had been fought just up the coast at Troy some four hundred before Homer lived. These stories had been told for hundreds of years. They had been recited by great oral poets, storytellers, who were honored by their society for their ability to know by heart thousands of lines of the whole long story of Troy. Homer’s decision to write down these stories is one of the most important moments in all of Western Civilization. It heralds the transformation of the older oral culture to the new culture of writing. And it preserved the text of The Iliad for us. Origins of Minoan civilization on Crete. Time of Homer's "Golden Age," Older than his own Ionian Greek civilization. Invention of Chariot Warfare. Invasion of Bronze Age Charioteers.Come from the north down into Greece . Creation of Mycenaean civilization in mainland Greece. Agamemnon, Menelaus, Helen. Agamemnon at Mycenae, Theseus at Athens. Oedipus at Thebes, Minos at Cnossus (Daedalus and Icarus in Labyrinth). Trojan War, Fall of Troy. ( In 2008, scientists Marcelo O. Magnasco and Constantino Baikouzis at Rockefeller University used clues in the text and astronomical data to attempt to pinpoint the time of Odysseus's return from his journey after the Trojan War. The first clue is Odysseus' sighting of Venus just before dawn as he arrives on Ithaca. The second is a new moon on the night before the massacre of the Suitors. The final clue is a total eclipse, falling over Ithaca around noon, when Penelope's Suitors sit down for their noon meal. The seer Theoclymenus approaches the Suitors and foretells their death, saying, "The Sun has been obliterated from the sky, and an unlucky darkness invades the world." The problem with this is that the 'eclipse' is only seen by Theoclymenus, and the Suitors toss him out, calling him mad. No one else sees the sky darken, and it is therefore not actually described as an eclipse within the story, merely a vision by Theoclymenus. Doctors Baikouzis and Magnasco state that "[t]he odds that purely fictional references to these phenomena (so hard to satisfy simultaneously) would coincide by accident with the only eclipse of the century are minute." They conclude that these three astronomical references "'cohere', in the sense that the astronomical phenomena pinpoint the date of 16 April 1178 BC" as the most likely date of Odysseus' return. This dating places the destruction of Troy, ten years before, to 1188 BC, which is close to the archaeologically dated destruction of Troy VIIa circa 1190 BC. Destruction of Mycenaean palaces & Minoan civ. New invaders(Dorians). Greek refugees from invasions leave central Greece. Move east across Aegean. Refugees establish colonies on the coast of Turkey (Ionia) .SUPREMACY OF TERRITORIALITY. Unique principle for political organization. Other organizing ideas: Egypt, Mesopotamia and India. Refugees fleeing Dorian invaders. Establish Ionian colonies.Miletus, Smyrna, Ephesus etc. First Panhellenic games at Olympia. First Olympics. First definite date in Greek history. Homer (writing in Ionia) memorializes Mycenaean civ. Agamemnon, Odysseus, Achilles, Paris, Helen, Hector. Battle of nearby Troy (north up the Ionian -Turkish- coast). Solon's legal revolution.constitutional reform of Athens. Thales of Miletus (Ionia), first scientist of natural world. Miletus in Ionia on coast of Turkey richest Greek city of all. Ionia more advanced than mainland Greece(Athens). Pythagoras of Samos (mathematics). Birth of Aeschylus. Ionian Greek cities rebel against Persian overlord. Destroyed in ensuing war against powerful Persian empire. End of great Ionian Greek cultural centers.Mainland Greece(Athens)estab. new centers of Greek culture. Battle of Marathon. (How far from Athens?). War Against Persia. Xerxes of Persia prepares another invasion of mainland Greece. Crosses the Hellespont with troops, animals on bridge of boats. New upstart democratic Athens the target. Army=2 million men(Herodotus). Battle of Salamis on Sept 23, in front of Athens. 1200 Persian ships to 300 Greek. Athens wins. Birth of Euripedes. Sophocles wins prize for tragedy. Defeats older dramatist Aeschylus. Age of Pericles , Anaxagoras, Protagoras, Sophocles. Pericles rebuilds the Acropolis. The Parthenon. First performance of Sophocles'Antigone . Sophocles general in war against rebellious Samos. PELOPONNESIAN WAR.Athens attempts impose supremacy. Sparta opposes. First performance of Oedipus. Death of Herodotus. Historian Thucydides. A general in Peloponnesian War. Athen's ill-fated expedition to conquer Sicily. Euripede's anti-war The Trojan Women. Defeat of Athens in Sicily. Athens in decline. Death of Euripedes. Sophocles speaks at funeral, commemorates his great rival, and death of Sophocles months later. Plato student of Socrates . Death of Thucydides. Birth of Aristotle. (Stagira in the north). Aristotle comes to Athens. Student of Plato. Philip II King of Macedon. Rise of Macedon in the north. Transfer power out of hands of fractious democracies. Rise of well-organized monarchy. King Philip of Macedonia defeats Athens-Thebes at Chaeronea. Young Alexander present. Distinguishes self as brilliant warrior. Alex & Hephaestion to Athens with Athenian dead. Only time Alex ever in Athens. Statues of Philip &Alexander erected on Acropolis. Assassination of King Philip.Alexander King of Macedonia. Birth of Zeno (in Cyprus) Stoicism, the Stoa=porch. End of heroic age of Greek philosophy. Battle of Issus: Alex defeats Darius. Darius flees, leaves wife, mother. Sisygambis, in hands of Alexander. Alexander conquers all Egypt. Almost no opposition. Battle of Gaugamela: Alex defeats Persians. Darius dies in the oxcart by the river, a Greek soldier finds him.The soldier brings water to the dying Emperor. Alex arrive son scene and weeps. Alexander adopts Persian dress, Greeks angry.Birth of Euclid, studies in Athens then to Alexandria. New exciting cultural center of Alexandria. Alexander marries Sogdian princess Roxanne. A new life as "husband." DEATH OF ALEXANDER (June 13) .Ptolemy brings body to Alexandria. Aristotle leaves Athens. Wont allow Athens to sin against philolosophy twice. DEATH OF ARISTOTLE. The philosopher is gone one year after his student. Ptolemies rule in Egypt 300 years. Cleopatra the last of the Ptolemies in Egypt. Flowering of Alexandria. Euclid comes to Alexandria, new center of science. Library of Alexandria, greatest in world. This outline of the Iliad was prepared by William Fredlund in August, 2000. The Iliad narrates a story that takes place during a period of fifty-one days at Troy. The events of fifteen days and five nights are shown in detail in the story while the remaining time is only indicated briefly in the narration such as the nine days of plague in Book I. The story opens in the ninth year of the war. The line numbers of the Greek text are indicated in parenthesis. All English translations, including the Robert Fagels edition that we use in class, provide you with the line numbers of the original Greek text. The quarrel of Achilles and Agamemnon(1-53). Chryses appeals to Apollo (33-43). Apollo sends the plague (44-53). The plague lasts nine days. The quarrel gets worse (188-194). Heralds go to Achilles (327-348). The embassy of Odysseus to Island Chryse (430-476). Eleven day absence of the Gods. Zeus and Hera quarrel (533-570). Olympian peace, banquet, sleep (595-611). Zeus sends dream to Agamemnon(1-47). Council of Achaean elders (48-483). Great simile: swarms of bees (87). Odysseus man of winning words. Thersites scene, mutiny attempt (211-278). Calming speeches, Odysseus etc, (279-393). Zeus sends Iris to Trojans (786-815). The preparations for truce (1-120). Great simile: stepping on snake (34). Menalaus agrees to fight Paris (120). Our first view of the fabled beauty Helen. Helen's view from the wall (121-244). Combat between Menalaus and Paris (314-382). Aphrodite rescues losing Paris (382). Aphrodite sends Helen to Paris (383-448). Helen and Paris make love (446). The breaking of the truce (1-219). Council of the gods (1-73). Zeus/Hera: "you want to devour Priam" (35). Great simile: like fly on a baby (131). Individual combats and full battle (517-544). Athena helps the Achaeans (1-453). The deeds of Diomedes to wounding (1-113). Trojans winning under Ares (454-626). Hera and Athena intervene for Achaeans (711-846). Hera and Athena return to Olympus (907-909). The battle, Nestor encourages Achaeans (1-72). Hector with his mother Hecuba (237-311). Hector with his brother Paris (312-340). Hector with his wife Andromache (370-502). Hector with his son (460-485). One of greatest scenes in whole of Iliad. Hector returns to battle (503-529). Combat of Hector vs Ajax (17-312). Council in Agamemnon's tent (313-344). Speech of Priam, supper, end of day (380). Truce, burial of dead (381-432). Achaeans build a wall (433-464). Sun goes down, Achaeanas share meal (465-482). Troops lay down, blessing of slumber (482). Assembly of the gods (1-52). Midday intervention of Zeus (68-77). Advance of Trojans under Hector (78-197). Hera angered by course of battle (198-252). Hector pushes Achaeans back (316-349). Zeus foils Hera and Athena (350-484). Great simile: watch fires like stars (555). Meeting in Agamemnon's tent (89-181). Odysseus leads embassy to Achilles (180). Emb finds Achilles singing of men's fame (186). Important: Achilles like Homer, the poet/singer (186). Important: Achilles on death (400). Report of failed embassy (669-713). Plans for nighttime spying (1-339). Diomedes/Ody in Trojan camp (469-525). Return of Dio/Ody to Achaeans (526-579). The Aristeia of Agamemnon=The Bravery of Agamemnon. "Now dawn rose from her bed" (1). Great simile: warriors like reapers (67). Great scene: The Gods (75). The test of Agamemnon(supremacy) (84-283). Advance of the Trojans (284-309). Achilles sends Patroclus to Nestor (596-848). The wall, history of the wall (1-35). Attack of Trojan ally (108-194). Hector smashes the gate (430-471). Poseidon interferes on Achaean side (1-125). Battle at the center (126-205). Zeus/Poseidon opposition on battlefield (345-360). Nestor takes stock of situation (1-152). Nestor and three wounded heroes (27-40). Agamemnon's fear and Odysseus' response (42). Four leaders take counsel (41-134). Hera and Zeus make love (346). New onslaught by Achaeans (440-505). Zeus awakes, argue with Hera (1-77). Zeus' plan for whole war (49). Is there no human freedom? Hera maneuvers against Zeus (78-156). Zeus orders Poseidon out of battle (157-219). Patroclus goes to Achilles (400-404). Battle around the ships (405-746). Patroclus asks to wear Achilles' arms (1-100). Patroclus & Myrmidons arm (130-220). Hector and Patroclus fight (731-828). Combat over corpse of Patroclus (1-139). Massed combat over corpse (140-423). Battle for the horses of Achilles (424-542). Return of Achaeans with body of Patroclus (543-761). Antilochus informs Achilles of Patroclus' death (1-34). Lament of Thetis for her son (35-64). Achilles tells Thetis: back to battle (65-147). Rescue of Achaeans by appearance of Achilles (148-238). Achilles with corpse of Patroclus (315-355). Important: the Shield of Achilles (468-614). The two noble cities (478). "As dawn rose up in her golden robe" (1). Thetis gives Achilles his new arms (1-39). Important: a changed Achilles (67). Achilles arms for battle (351-398). Achilles & horse Xanthos (399-424). This is the most important book for Virgil's Aeneid. "Go help whom you want"(25). Combat of Aeneas and Achilles (76-352). Hera tries to intevene on Achilles side (112-155). Achilles' rage and flight of Trojans (353-503). Achilles fights the Trojans in the river (1-232). Battle of the Gods (385-520). Trojans fight back into city (520-611). Here we see Gods and Men. Best Book for seeing relationship of Gods and Men. Is Homer criticizing Gods esp lines 246ff.? Trojans in the city (1-130). Encounter of Achilles and Hector (131-166). Gods debate Hector's fate (167-247). Achilles' mistreatment of Hector's corpse (395-404). Achilles and Patroclus' corpse (1-58). Patroclus appears in dream (59-110). Burning of Patroclus' corpse (110-225). Burial of Patroclus' bones (226-257). Mistreatment goes on for 11 days (22-30). Council of the gods (31-142). Thetis goes to Achilles (120-140). Zeus to Priam: go to Achaeans (143-187). Priam goes to Achaeans (188-467). Priam arrives Achilles camp (471). A bed for Priam (628-676). Priam will bring home Hector (677-804). Priam arrives Troy with Hector (698-718). Lamentations of Andromache, Hecuba, Helen (719-776). Build Hector's pyre nine days (777-784).